Heat oil in a large pot over low heat. Stir-fry the chopped peppers, garlic and onion, and stir until they’re golden brown. Add 3 cups of rice; remember to stir everything well. Add 5 cups of water, the chopped veggies, chicken breast, bouillon, seasoning and salt. Stir and let cook at medium heat for approximately 15 minutes or until the rice dries. Once rice has absorbed all the water, cover the pot and cook at low heat for 10 to 15 minutes until the rice is soft. You can accompany this delicious dish with fries, tomato sauce, lettuce or fried plantain. Another tasty suggestion that my children love is to add turkey sausage cut in small pieces once the rice is cooked. 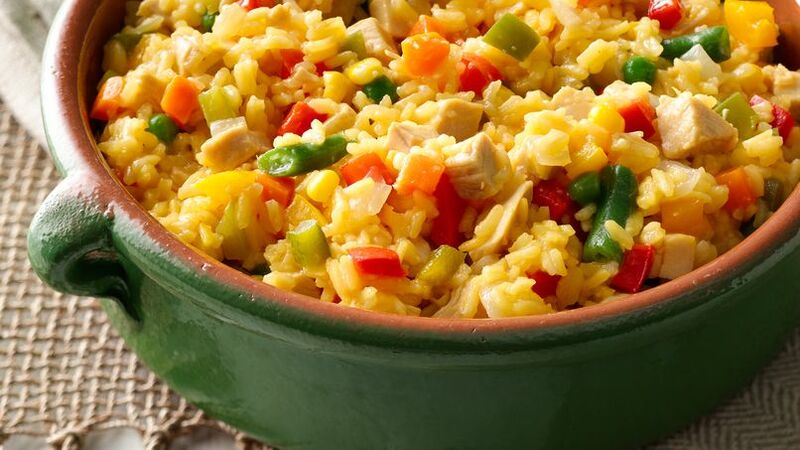 I consider “Arroz con Pollo” (rice with chicken) a Colombian gastronomic classic. I don't think there are two ingredients that go together better than chicken and rice. It's an easy recipe to make, it’s tasty, and it yields many portions. For me, this dish is synonymous with having guests over, the perfect excuse to create one of those family reunions in which you share anecdotes, stories and of course, the authentic flavor of my country. For as long as I can remember, it was a custom in my home for my mother to prepare Arroz con Pollo on Sunday. I remember her in the kitchen, very early in the morning, cutting the chicken carefully, adding the marinade and letting it slow-cook in its own juice. According to her, the secret to the exquisite flavor is the love and cooking time you put into it. I invite you to share and delight with this flavorful traditional Colombian dish!